Powers/Abilities: Cat Girl is extremely agile, and has a degree of enhanced strength. 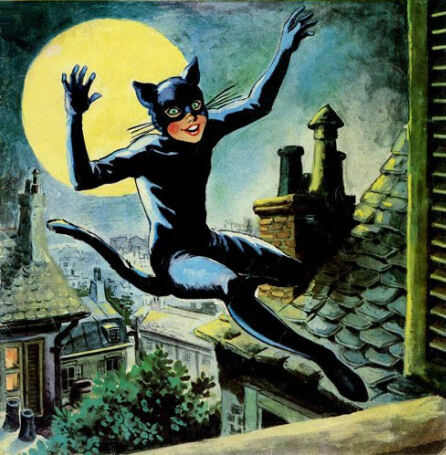 While wearing the cat suit she can climb like a cat, can see in the dark, and basically has all the powers of a human cat. These include the ability to sense danger, nails able to cut things like they were scissors, an infallible sense of direction, at least for finding her way home, and the ability to follow a scent. 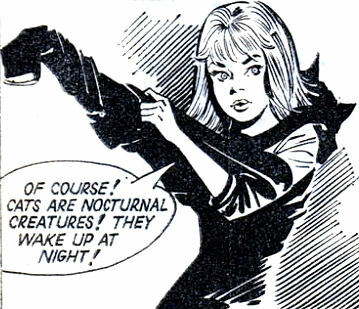 In one instance, when Cathy has been hypnotised, the trance is broken as soon as she puts on the suit. There are drawbacks to wearing it however - she becomes scared of water and loses her ability to swim, she becomes nervous around dogs, and she gains a craving to eat fish and wash her hands with her tongue! History: The daughter of a widowed private detective, Cathy discovers a cat suit in a casket in the attic, which she tries on. The casket had been sent to her father by a grateful African witch doctor, and imbues her with cat-like powers. With it she proceeds to help her father fight the Eagle, a criminal mastermind. Comments: A good example of a superheroine created specifically for girls in a girl's comic (as opposed to one created in a "boy's" comic with the hope of encouraging more girls to read the magazine). The Spanish version of this strip was "Caty, La Chica Gato", and was published by Editorial Bruguera S.A. Thanks to Jean-Paul Tantte for this information. Theodoor Westerhof has been in touch to give details of the Dutch reprints of the character: "The comic appeared in Tina, the large successful Girl Comic in Dutch comic history. Tina appears weekly since the 10th of June 1967 till the present day. The comics in the Tina are British, Dutch and Spanish products. 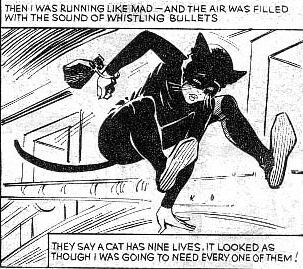 One of the British comics appearing in the Tina in the early Days was Cat-Girl. Im not sure about the start of the publication, but the comic was published in 1970, 1971 and 1972. The last episode was published in Tina #26 in 1972. 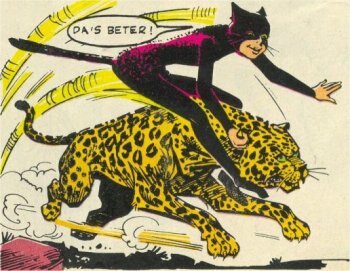 In Dutch the comic is called Katja, de schrik van de onderwereld. Our heroine, identified as het katmeisje (=the cat girl), is called Katja. Her family name, properly said the family name of her father is given as Kruif, when hes addressed by the chief of the (British) secret service. So we can conclude from it that her Dutch identity was Katja Kruif. The comic appeared in color. Her cat-suit has a purplish colouring in the Dutch version. The Eagle was not her only opponent, she had others like X. The final installement of her strip showed the Eagle and his gang being arrested in Latin American mountains" Thanks for this intriguing extra information Theodoor. He also sent me several scans, which you can see here.